Popular award-winning harpist Luisa-Maria Cordell has travelled the world performing and teaching the harp, and is considered to be one of the foremost harpists of her generation. Luisa enjoys a varied free-lance career playing for weddings, civil partnerships corporate events, recitals and orchestral work. Luisa prides herself in delivering a high standard of performance, with impeccable presentation, whilst maintaining a reliable and friendly approach. She proudly plays a Salvi Arianna concert harp which is considered to be a distinguished harp of exotic beauty, visually and audibly, skilfully crafted from a collection of rare woods from around the world. 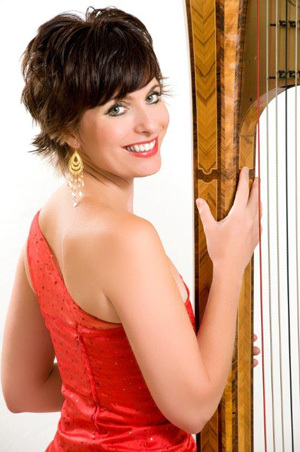 Luisa received her training from tutors at The Royal College, Royal Academy and The Guildhall and graduated with a music degree from the University of Surrey specialising in harp performance. While at school and university she won a variety of performance awards as well as scholarships to attend European summer schools. She was also awarded the prestigious University Crosier-Hughes performance award two years in succession. Luisa-Maria is regularly invited to perform for dignitaries including HM The Queen, HRH Duke of Edinburgh, The Lord Chancellor and heads of state including playing for private functions held at The Savoy, Claridges, Victoria and Albert Museum and many other hotels/venues in London and the South East. She was also the resident harpist at Warwick Castle for three years, and is currently resident at the RAC club (Epsom/Pall Mall). An experienced recitalist and orchestral player, she regularly performs for music societies, music festivals and at many of the UK’s principal concert halls, including St Johns Smith Square, The Barbican, Banqueting House, The Queen Elizabeth Hall and at the Edinburgh Festival. Luisa performs both as a solo recitalist and as part of a duo with Soprano Sarah-Jane Dale and Flautist Nicholas Cartlidge. Luisa has performed with many leading orchestras including the London Sinfonietta, London Academic Orchestra, Central Festival Orchestra, East of England Orchestra (Sinfonia Viva), Opera North and Bournemouth Symphony Orchestra Players. Luisa is frequently the featured classical artiste on the International Majestic, Page and Moy , Fred Olsen and P&O cruise liners, traveling all over the world. Luisa regularly gives harp demonstrations for the WI, Nadfas, and U3A (University of the 3rd age). At these events, Luisa enjoys explaining the history and the development of the harp in an engaging concert and narrative presentation combined with some of her memoirs of being a harpist. As well as performing Luisa-Maria is a popular tutor, who enjoys working with children and adults passing on her love of the harp. She also has many private pupils and is now harp tutor at St Catherine’s School and Charterhouse School. Luisa is also invited tutor at The Edinburgh Harp Festival and Clarsach Society courses, and is harp adjudicator for Bromley Music Festival and Sevenoaks Music Festival . Luisa is the founder and director of the National Youth Harp Orchestra, which currently has thirty members. They have recently performed at the Barbican and at The Royal Albert Hall. She has also led them on many successful concert tours to Belgium, France, Portugal and Wales. Luisa has released two harp and Soprano CDs : ‘A Million Pearls’ and ‘The Nightingale’. She has also recorded two solo CDs: ‘The Swan’ and ‘Circle of Light’ – the latter recorded for holistic and relaxation purposes. She was also privileged to record a Harp/Cello duet album with Julian Lloyd-Webber.